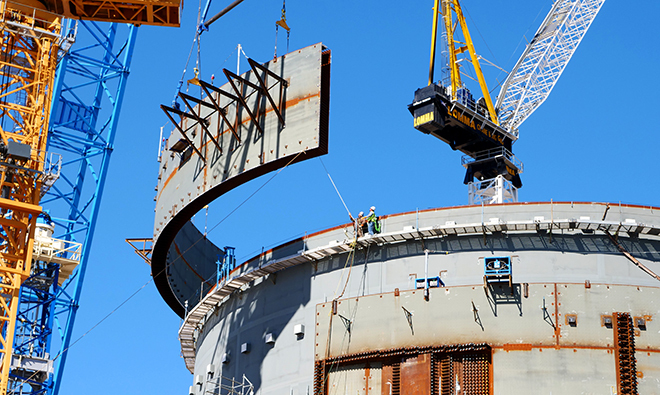 Workers install a section of Vogtle unit 3's shield building in November 2018. Georgia regulatory staffers revealed they could sue Georgia Power Co. if they believe that its Vogtle nuclear project costs were imprudently incurred, but any litigation would not occur until 2022, when the second of two new reactors is targeted to come online. At an all-day Dec. 18 meeting to hear testimony on the Southern Co. subsidiary's latest spending at Vogtle, Georgia Public Service Commission staffers and their outside partners were asked to justify their recommendation for an expanded oversight effort at the troubled nuclear venture, which is years behind schedule and billions of dollars over budget. "We have an obligation to perform the best job that we can ... 2019 and 2020 are critical years in this project," Steve Roetger, the PSC's lead Vogtle analyst, said of the specialized, difficult construction tasks ahead for the thousands of workers on the ground in Waynesboro, Ga.
"I'll not shy away from this: we have agreed to not litigate until unit 4 comes online," Roetger added. "My hope is that we won't be litigating; I suspect that we will. But we need to maintain that record for the public interest ... Now that the whole project is wide open, it's not simply saying 'They didn't maintain the schedule.' It's going to have to be much more articulated." Unit 3 is slated to achieve commercial operation in November 2021 and unit 4 in November 2022. But Georgia Power, in conjunction with corporate affiliate Southern Nuclear Operating Co., is pushing a self-described "aggressive" timetable to complete the reactors eight months ahead of those dates. State analysts doubt that accelerated schedule will come to fruition, however. The PSC meets every six months to review Georgia Power's Vogtle expenses, not for future cost recovery but simply to certify that the spending actually occurred. Prudency hearings are expected to happen after unit 4's in-service date. Any recommendation by staff that the PSC should not approve Vogtle cost recovery at any level would have to be ultimately adopted by commissioners, Roetger said, adding that potential expenses clawed back for ratepayers could be in the order of "many, many times." 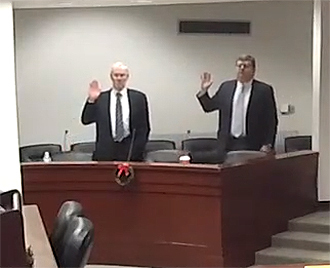 Bill Jacobs and Steve Roetger are sworn in before testifying. Roetger and his colleague, GDS Associates executive consultant Bill Jacobs, both reaffirmed that Vogtle is progressing much better under the management of Georgia Power and Southern Nuclear, who took over from then-builder Westinghouse Electric Co. LLC after it declared bankruptcy in March 2017. "The production levels are much greater today than they were when Westinghouse was in control. We can see that out on the site," Roetger said. "The rate at which those structures and components are being assembled into units has increased significantly since [Southern Nuclear] has taken over." "I would just add anecdotally, we spend a fair amount of time on the site, and just walking around, it's much busier," Jacobs said. "People are much more actively engaged in the work. It's a much more efficient process." Another analyst retained by the PSC — Don Grace, vice president of engineering at a joint venture between Critical Technologies Consulting and Cost Plus Consulting — echoed ongoing staff criticisms that Georgia Power has not yet completed an integrated project schedule, a key guide seen as the most thorough outlook of Vogtle's viability. Finishing the document is "challenging but feasible," Grace said. Responding to questions from an attorney for Georgia Power, Grace said, "It's fair that we are not aware of risks that [the utility is] ignoring ... I have no question that they have the capability to successfully achieve commercial operation." That contrasts with Vogtle's sister project in South Carolina, the V.C. Summer nuclear plant expansion, which was abandoned in July 2017 by SCANA Corp. and Santee Cooper after they experienced cost overruns and schedule delays. Those companies have been accused by state and federal officials of disregarding a 2015 report by Bechtel Corp. warning of Summer's flaws. Describing Georgia Power's "aggressive" schedule, Jacobs said he did not know whether to categorize it as good or bad. "I think it's always good to have an aggressive schedule," he added. However, "If the schedule's too aggressive, then it can create other problems." "I think it's a bit of a fine line," Roetger said. "You want to be aggressive, but clearly what we experienced under Westinghouse management was schedules were not taken seriously. Everybody knew that they were not going to be met. "It's a balancing act. I think [Southern Nuclear] management is trying to run that gauntlet, if you will, to push the project as fast as they can without demoralizing the craft and everybody that's involved on the project. Because who wants to go work every day knowing you're not going to meet your expectations?" Commissioners are slated to vote in February 2019 on whether to certify Georgia Power's project costs in the first half of 2018. The utility actually spent $578 million during that time, but Roetger and Jacobs said $51.6 million for a Westinghouse audit should be subtracted to produce the final verification total of $526.4 million. Vogtle is also owned by Oglethorpe Power Corp., MEAG Power and Dalton Utilities.